Docupilot is a document generation and automation software designed to speed up the documentation process. In just a few clicks, anyone can create detailed and precise documents from scratch and adhere to professional documentation standards and to the user’s custom preferences without having to manually enter details such as client information, address, and main content. Users can also generate new documents using existing ones by easily replacing details, allowing users to maximize old templates while creating and delivering personalized documents per client. Docupilot helps users save time and effort by automating the documentation process, freeing them from the mundane tasks of writing, saving, editing, and sending content so that they can focus on other pressing tasks and priorities. Whether you are working on contracts, receipts, agreements, and other important paperwork, you can trust Docupilot to turn the whole process into a lightning-fast workflow. 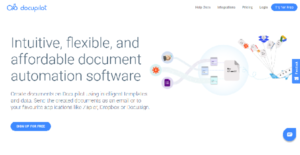 Docupilot’s most obvious benefit is that it accelerates your documentation-related workflows by automating many of the steps, from creation to editing to delivery of the documents to email inboxes or cloud-based storages. Gone are the days where you have to spend hours in front of a computer and manually type the words and fill spaces and boxes with the appropriate information. With Docupilot, everything is automated. All you have to do is select your preferences, fill in the necessary details, and Docupilot will take care of the rest. And if you want to use an existing document as a template, then all you have to do is change the details and you are good to go. The same is true even with the most complex documents. Integrations with CRMs, HRM systems, forms, and databases allow you to import data into the software, which means you never have to re-enter the same data more than once. The information contained in your documents should be safe from unauthorized access and parties. You can add a password feature per document to ensure that they are only accessed by those with the proper permissions. What Problems Will Docupilot Solve? Generating & Sending Offer letters from HR management software. If you are interested in Docupilot it could also be sensible to investigate other subcategories of Best Document Creation Software collected in our base of SaaS software reviews. There are well-liked and widely used systems in each software category. But are they essentially the best fit for your enterprise’s unique requirements? A popular software solution may have thousands of users, but does it provide what you need? For this reason, do not blindly shell out for popular systems. Read at least a few Docupilot reviews and consider the elements that you wish to have in the software such as the cost, main features, available integrations etc. Then, choose a few apps that fit your needs. Try out the free trials of these apps, read online comments, get information from the maker, and do your homework meticulously. This in-depth groundwork is sure to help you choose the most excellent software application for your company’s special needs. How Much Does Docupilot Cost? We realize that when you make a decision to buy Document Creation Software it’s important not only to see how experts evaluate it in their reviews, but also to find out if the real people and companies that buy it are actually satisfied with the product. That’s why we’ve created our behavior-based Customer Satisfaction Algorithm™ that gathers customer reviews, comments and Docupilot reviews across a wide range of social media sites. The data is then presented in an easy to digest form showing how many people had positive and negative experience with Docupilot. With that information at hand you should be equipped to make an informed buying decision that you won’t regret. What are Docupilot pricing details? What integrations are available for Docupilot?